COLLEGE STATION, TX—Having evidently entered the “bargaining” phase of grief in the wake of George H.W. 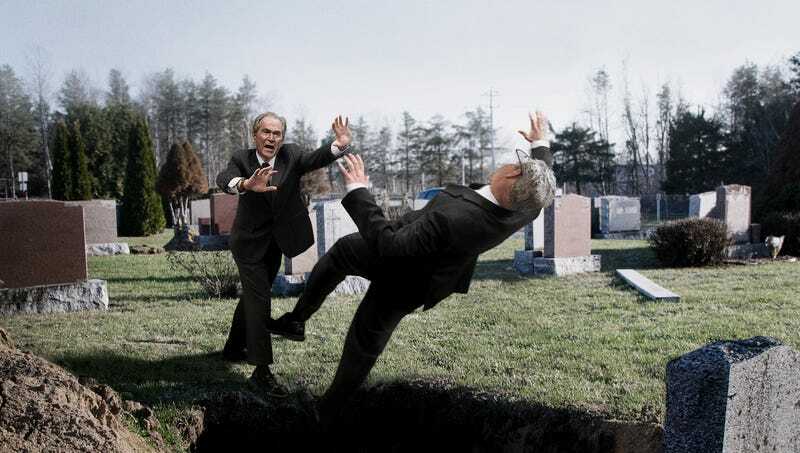 Bush’s death, witnesses confirmed Thursday that George W. Bush shoved his younger brother into their father’s open grave while screaming “No, take Jeb instead!” “Please! Please! Oh, God, please don’t take my father away from me—take Jeb!” cried the former president and son of the deceased, wailing and thrashing as he fought his way past the several mourners and secret service agents in his way before using all his strength to push his brother toward the prepared burial site. “Please, God, it’s not fair that he should have to die while Jeb continues to live! Please, take my dumb little brother and let my dad live—he has so much left to do here on Earth! Jeb is just annoying and pathetic. No one wants him around.” At press time, a defeated Jeb Bush had sighed and quietly agreed to be buried alive.